You may have noticed we’ve blogged more frequently lately. By “lately”, we mean the last week, that counts- right? We’re excited to put more energy into the Foodtrainers’ blog. With that, we have a new feature. For a while, we’ve toyed with doing some sort of a weekly roundup, but weekdays are so busy. We realized, we do a lot more experimenting Friday through Sunday. We’re always sharing with each other what we did over the weekend. Now, we’d like to share it with you. Lauren: I was a little annoyed Saturday morning. It was a stormy, or semi-stormy, day and I didn’t have a book that excited me. And then A Beautiful, Terrible Thing was delivered and I couldn’t put it down. 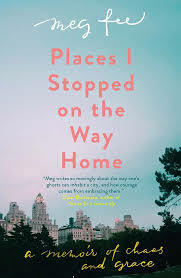 Carolyn: Last weekend I started (and finished which is big for me) this book of short stories Places I Stopped on the Way Home about living, loving, and the general chaos of existing in NYC in your 20s and 30s. It’s like a neighborhood tour of love and heartbreak and growing up. Lauren: I watched the chef, Sandra Lee’s HBO documentary about her breast cancer diagnosis and surgery. It made me see her and Governor Cuomo in a different, more human way. I also watched Private Life. It’s a movie about a fertility/infertility. It was touching but also funny and real. Carolyn: I saw Dear Evan Hansen on Broadway. I’m still processing it all but, like the rest of the world, I highly recommend it. It was one of the best shows I’ve ever seen. Lauren: Aside from a ton of teen food (Immaculate Baking Cinnamon rolls, many sandwiches), I baked some apples. I actually invested in an apple corer. I filled the apples with our fave walnuts, coconut flakes, cinnamon and a little Kerry gold butter. I put a little water in the baking dish, enough to cover the bottom, and baked them for an hour at 375. They were good when I made them but the winning move was warming a baked apple up and adding a dollop of plain, White Moustache Greek Yogurt for breakfast. Carolyn: uh oh caught me, I mostly ordered in this weekend but I did make this zucc soup and heated up these gluten free Brazi Bites Lauren introduced me to these, from Shark Tank. Cheesy cassava “rolls”, I had them with eggs and spinach. They are so yum. Also, it’s not human food but I introduced my dog to these CBD treats and they seemed to work wonders. We love hearing from you? What are the you reading, watching and cooking these days?